Richard Hickox has played a central and crucial role in keeping British orchestral music in the limelight, both in the concert hall and in the recording studio. With his own orchestra, the BBC National Orchestra of Wales, he now embarks on another important project: the orchestral music of Frank Bridge. Many will know Bridge chiefly as the teacher of the young Benjamin Britten, but he was a major figure in his own right, not only as a composer but also as a performer, one of the leading exponents of chamber music (he played the viola) in British musical life during the first quarter of the century. Chandos begins this Bridge survey with a work from Bridge's mature years (1927), the rhapsody inspired by the Sussex Downs where he lived, entitled Enter Spring. Make no mistake, this is a glorious and masterly work, arguably the finest music Bridge ever composed. And Hickox certainly has the music's measure, drawing sensitive playing from the orchestra and shaping the subtle ebb and flow of the developments with tenderness and feeling. The Chandos recording sounds excellent, with abundant clarity and atmosphere and richly resonant climaxes. After this, the remainder of the programme is something of a make-weight. The Two Poems for Orchestra, introduced by Henry Wood towards the end of the First World War, are skilfully written and nicely shaped, and because they are so different in outlook they work rather well as a pair. Bridge under-sold himself by opting for this bland title. Both orchestral Poems were inspired by the writings of the self-styled 'nature mystic' Richard Jefferies, the first a veiled and atmospheric tone poem, the second a lively scherzo, with abundant orchestral brilliance. The BBC NOW delivers both these priorities with due sensitivity in No. 1, due panache in No. 2. Wood had introduced the symphonic poem Isabella some ten years before, in January 1907. Inspired by the examples of Liszt and Strauss, it is a narrative piece based on Keats's adaptation of Boccaccio. To paraphrase Paul Hindmarsh's excellent note : 'Isabella is in love with the handsome Lorenzo. When her two merchant brothers discover this they lure him into a forest and murder him. In a dream Isabella is visited by Lorenzo's ghost and, taking her nurse with her, rides into the dark of the forest, digs up her lover's body and places his decapitated head in a pot of basil. Her brothers remove this and Isabella is heartbroken and dies, forlorn.' 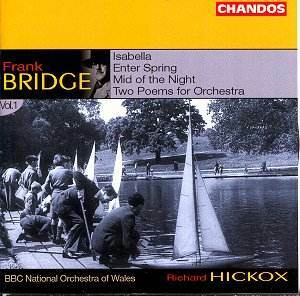 Bridge builds the music around the two themes for the lovers, a noble horn call for Lorenzo and a tender oboe melody for Isabella. The construction is imaginative, the orchestration masterly, and the music gains a sensitively shaped performance on this disc. The remaining item is another symphonic poem. Mid of the Night is the earliest music on the disc, and frankly it sounds it. First performed in 1904, this recording is reckoned to be its second performance. At nearly half an hour long it is too extended for its material, however committed the performers are to the cause. Th orchestral palette holds much interest, showing the degree of influence (Elgar and Tchaikovsky come to mind, for example) to which the young Bridge was susceptible. With excellent sound, and repertoire which includes a real masterpiece and other music of much interest, this CD makes a compelling beginning to Chandos's new cycle of the orchestral works of this splendid British composer.